U.S. stocks advanced for a sixth straight day on Friday, as investors took solace that a weak August payrolls report would likely prompt the Federal Reserve to hold off raising interest rates in September. Nonfarm payrolls rose by 156,000, shy of economists’ 180,000 consensus forecast, while revisions for the prior two months subtracted 41,000 jobs. Payroll wages rose just 0.1%, below projections and down from a 0.3% July increase, while separate data showed the unemployment rate inched higher to 4.4% from 4.3%. Investors’ disappointment with the jobs reports was offset by a jump in consumer sentiment, which rose to a three-month high, as well as separate readings of manufacturing activity that expanded last month. The ISM factory index climbed from 56.3 to 58.8 in August, the fastest pace of expansion in six years. For the week, the S&P 500 rose +1.43%, the Dow Industrials gained +0.80% and the MSCI EAFE (developed international) advanced +0.57%. As the largest equity market in the world, the breadth and depth of the U.S. stock market can be intimidating, even for seasoned investors. 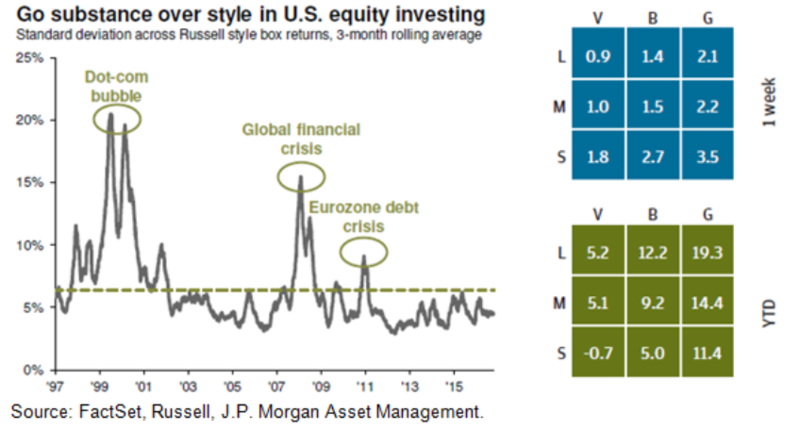 The complexity of the market has led to a series of classification systems aimed at finding “the method behind the madness” and- late into the expansion and equity bull market- investors have become increasingly focused on "style boxes." 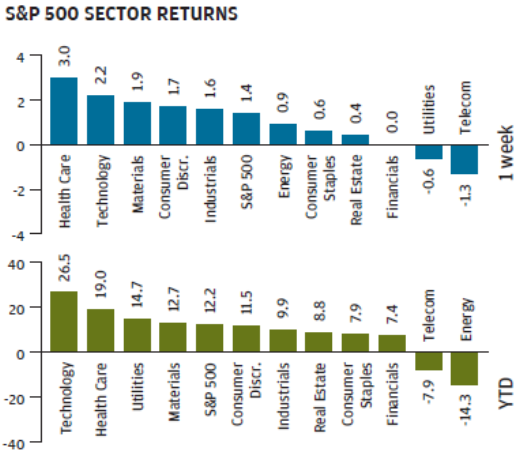 While questions of small cap versus large cap or growth versus value seem like compelling ones, the benefits of any particular style box at any particular time are actually relatively muted, according to J.P. Morgan. As shown within Chart 1, the dispersion of returns among style boxes for equity indices is, perhaps surprisingly, quite low. Indeed, in only three major instances over the last 20 years – the dot-com bubble, the global financial crisis and the Eurozone debt crisis - has holding one style box over another paid off in a material way. Investors should therefore be wary of solely relying on this classification system and instead consider another: sectors. In a time of changing U.S. monetary policy and accelerating global growth, investors should examine those sectors that benefit from rising rates or international exposure, perhaps tilting toward a more bottoms-up approach. JP Morgan thinks the message is simple: invest in substance, not style.